Several studies conclude that major health and social problems are more common in more unequal countries and states. Internationally, Scandinavian countries and Japan were rated the highest on the healthy end of the distribution. In this chapter, we will proceed to present our theoretical model, and then the model will be used for econometric specification to test our hypothesis. We will extend our previous analysis to an empirical formulation to examine whether there is a long-run relationship among the variables obesity, poverty, and income inequality. 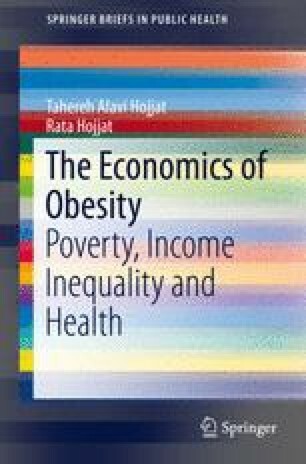 The panel co-integration tests point to the existence of a long-run relationship between obesity and income inequality and poverty.